A Native American artist is creating a large-scale portrait made from more than 4,000 handmade clay beads. The project is intended to bring attention to the disproportionate victimization of indigenous women, girls and LGBTQ people. Each bead represents a missing or murdered indigenous person, according to artist Cannupa Hanska Luger, and he said he's using beads made by communities across the U.S. to complete the project. His portrait will be created in collaboration with queer indigenous Canadian photographer Kali Spitzer. A Canadian government minister recently suggested as many as 4,000 indigenous women (not including transgender women) have gone missing or have been murdered in the past three decades. While the U.S., home to approximately 5 million American Indians and Alaska Natives, does not have a similar system for tracking missing and murdered indigenous women, the U.S. Bureau of Justice Statistics asserts that "American Indians and Alaska Natives experience violent crimes at rates far greater than the general population." Luger said his beaded portrait is an attempt to humanize the sobering data. “I know how important it is to create policy and run numbers, but on a human level, it’s really difficult for me to relate to the data-driven number,” said Luger, an enrolled member of the Mandan, Hidatsa and Arikara Nation tribes, which are primarily based in North Dakota. Luger said while he was working on creating individual beads, the meaning behind each one started to take hold of him. “As I’m rolling these beads in my hand, I’m realizing what they represent,” he said. “The data is numbers, but the numbers represent lives. These are human lives." What initially started out as a solo bead-rolling project turned into a group effort that included communities across the country. Luger simplified the bead-making process so anyone could make them, and then he uploaded a bead-making tutorial online in December. Soon, people across the country started creating the beads for his large-scale portrait. Luger said by creating the beads by hand, participants are taking a real role in activism, not just liking or sharing something on social media. The portrait Luger is creating, and the Kali Spitzer photograph from which he's taking inspiration, is of an unnamed woman. While her name is not shared with the public, Luger said her backstory is poignant: Her sister is one of the missing and murdered indigenous women Luger is seeking to honor. “I like the idea that within the image itself, there’s an embedded history of the issue,” Luger said. Anita Fields organized a recent gathering of artists and activists in Tulsa, Oklahoma, to make beads for the project. 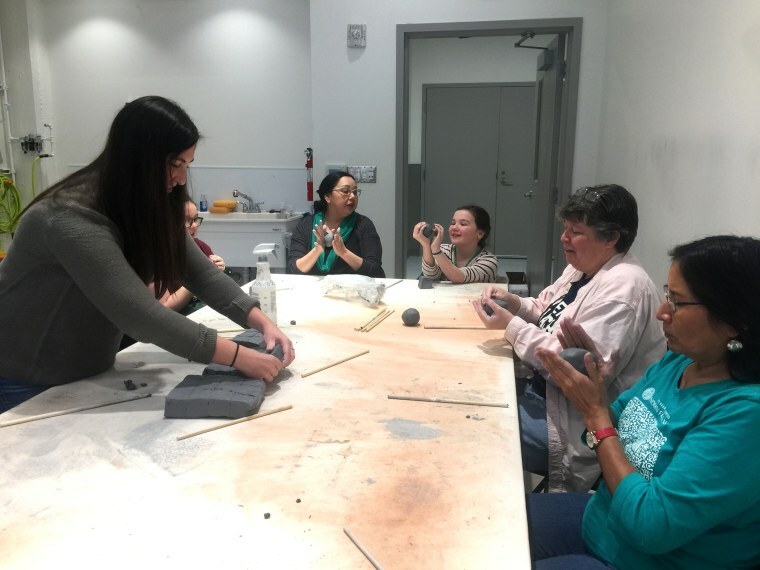 Fields said the issue is mostly known among Native American communities, but she said activities like her bead-making workshop help reach a wider audience. “The idea that we here in Tulsa and can be a part of this project is very awesome,” she said. Alana Breshears brought her two daughters, Riley, 13, and Logan, 11, to Fields' bead-making event. She said her family has been touched by domestic violence, and she added that teaching them about the issue is important, so they don’t repeat it in their lifetime. “They are both very artistic, as well, and it just meant a lot to be a part and help educate and be a part of something bigger than themselves,” Breshears said. Christina Burke is the curator of Native American and non-Western Art at Tulsa's Philbrook Museum of Art, which funded Fields' gathering. She stressed the importance of drawing attention to the victimization of vulnerable indigenous people. Luger said all 4,000 beads must be completed and collected by early April, and then he will have about a month to work on the piece. Once finished, it will be in display at the University of Colorado in Colorado Springs.